I am passionately interested in observing and capturing the way my (and others’) reading habits are changing across the years due to so many hyper-accelerated changes around us in terms of information, communication, technology, and accessibility. how does my reading change? how do the contribution of others via the #innovatorsmindset‘s hashtags or comments influence, complement, extend, amplify, change me reading of the book? can I try to amplify my skills and fluency of reflection and metacognition via visuals and videos? how about new forms? 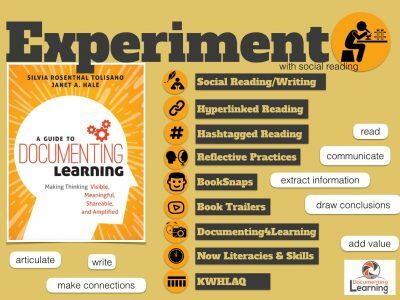 new forms of reading, reflecting, connecting, communicating, learning, documenting? I am intrigued by the concept of SOCIAL READING. Reading, not as a solitary activity but reading as part of something bigger. When you google “social reading”, you come across a variety of definitions. You will also learn that social reading has been around for centuries (ex. sharing favorite passages of a book out loud in front of a fireplace). What has changed is the degree of amplification that is possible today, due to technology. What has changed is how we can re-define social reading. In our hyper-connected digital world, the reading ecosystem is changing, involving new and old players in different ways, facilitated by apps and forums and bloggers and book sites and book retailers. In a 2015 survey of over 2000 readers, 45% agreed with the statement ‘because of social media I read more than I used to’, while half agreed that ‘social media has changed the way I read. Angela Stockman read one of my tweets about social reading and contributed her insight. I am looking at the concept of “social reading” as reading, NOT as an activity that is being done alone, in isolation, but also as an action that relies on and contributes to the reading of others. How do we amplify reading as a solitary activity to a collaborative, crowdsourced and social activity among other readers? How do we become aware and take advantage of reading to be able to add value to others who will also add value to our learning and thinking? How do we read, by keeping curation and sharing of perspectives, connections and information with/for others in mind? How do we create transmedia experiences as a result of our reading? 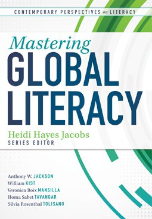 How do we “translate” text based reading into other media forms to support and amplify the content of our reading? 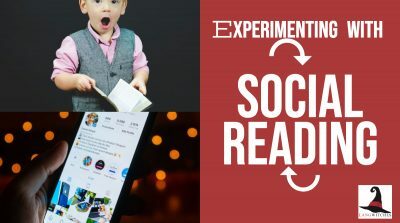 I am challenging you to experiment on your own around social reading. 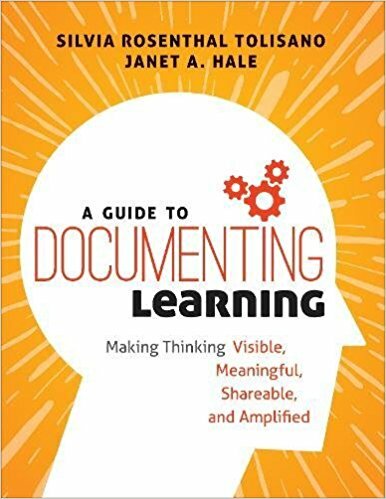 Take a book, such as A Guide to Document Learning and connect to other readers and to Janet Hale and me, as the authors. Be aware of your reading experience. What works? What does not? What are you having difficulty with? What are your social reading skills and fluency? I find the idea of ‘social’ reading really interesting Silvia. It has long been a driver for me, sharing summaries and responses. In the past I did this on Twitter, but have since moved such interactions to my commonplace blog. Something I am interested in investigating further is Hypothes.is. Kevin Hodgson and Ian O’Byrne are great proponenets of this.